Discipleship is an investment of your time, energy, and life. A wise investor considers carefully before he makes a choice. While God wants everyone to know him, some people in your life will make better disciples than others. We often don’t know who to chose as a disciple or how to make that decision. Carefully consider what to look for in a good disciple and find people with those qualities to disciple. Three fruit on a table all have different qualities but you must choose one. The same is true of our disciples. What should we look for as we choose the best person to pour our life into? Jesus knew his choice of disciples was so important that he prayed all night long about the decision (Luke 6:12). Many people have invested many hours in disciples that flaked out on them or were not capable of continuing the discipleship chain. What I want the group to know and understand: To know what kind of disciples to look for and understand why that decision is important. What I want the group to experience: The joy of choosing a disciple wisely and eventually seeing their disciples disciple others. How I want the group to respond: By making a list of potential disciples and setting up an appointment with them. 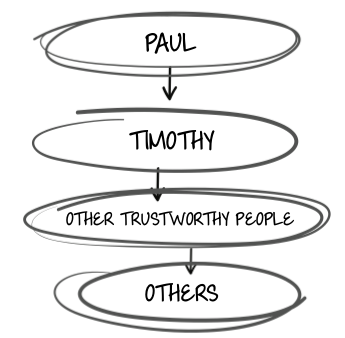 Paul wanted Timothy to look for trustworthy people who would pass it on to others. Some people will make better disciples than others. If they aren’t trustworthy and can’t pass it on to others, they may still be great people, but have some growing to do before they are ready to disciple in this way. Paul wasn’t just wanting Timothy to reach one person, he was wanting him to start a discipleship chain that would go on and on and on and build the kingdom of God for generations to come. Timothy would also impact the lives of many others along the way, but he could only invest heavily into a few at a time. Leaders, the chart is filled out for you but it is blank for your students. If they get stuck, help them fill it out so that they can better understand how this chart works. Choosing who you will build into is an important decision. In every important area of life, we choose carefully: where we go to college, whom to marry, who to take to the prom, etc. How much more so in this area? You only have so much time to invest in someone. Give your students an opportunity to talk about this question. In the next few questions we will be giving some answers but in this question, there is no wrong answer. Allow the group to discuss. The answers are pretty much spelled out in the definitions above, but ask your students for examples of how they might identify these things in a disciple and why they are such important qualities. Help them bring this into a real life situation. Choose a disciple that you connect with and enjoy being with. Chose a disciple who has some influence on others. Brainstorm with your group. Write all the names on a sheet of paper; if you can use a whiteboard or chalkboard, even better. We are looking for a lot of names here so encourage them to keep thinking. For some people this will really open up their minds to the people in their lives that they could disciple. Stay clear of any evaluations of the potential disciples at this point, just generate a lot of names. Be very careful with this one, it could result in gossip or judging. We just want to help our students learn to evaluate why some people may be more F.A.T. than others and help them make wise choices. Allow the group to discuss. Jesus spent a lot of time praying before he picked his disciples and if he did, we should do the same. Encourage your students to spend some time praying about this decision. Take some time to pray for that around the table or in pairs. Ask the Holy Spirit to guide them in their choice of disciples.